I am always Chilly Willy, I am frozen thru and thru. My head is hot and my TOES are cold, ah-he-ah-choo! Be careful this winter as the temperatures drop. Frost-bite is always a concern this time of the year. If you suffer from neuropathy, you need to be extra cautious. I have had several patients over the years that have suffered frost-bite to the point that requires amputation. One gentleman stands-out as he was a 56 y/o patient with diabetes and neuropathy. He shoveled his car out of a snow bank for 2 hours in flip-flops. It didn't take long for gangrene to set it and 5 days later he required amputation of half of his foot. 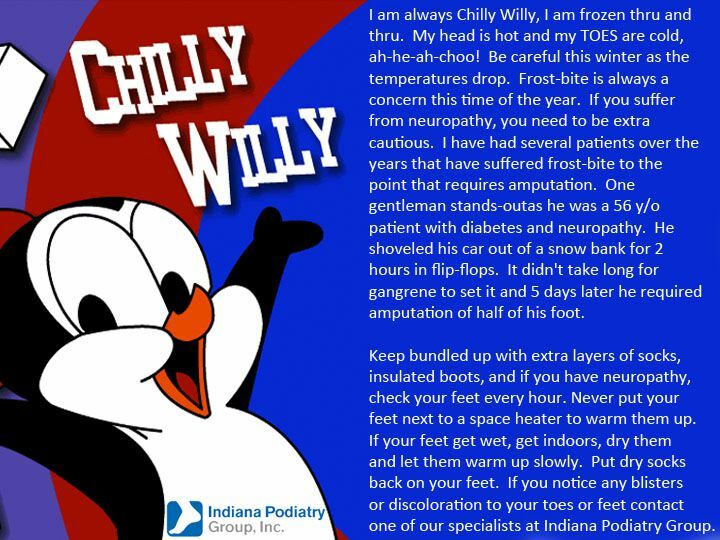 Keep bundled up with extra layers of socks, insulated boots, and if you have neuropathy, check your feet every hour. Never put your feet next to a space heater to warm them up. If your feet get wet, get indoors, dry them and let them warm up slowly. Put dry socks back on your feet. If you notice any blisters or discoloration to your toes or feet, contact one of our specialists at Indiana Podiatry Group.